Unless Carnaween is a spelling error for Carnaneen, it does not seem to match with the Irish form Carn na nÉan. Carnaween is the 502nd highest place in Ireland. As Carnaween is a bit of a western outlier, doing it on it’s own is not a bad idea, especially if time, weather or laziness is a factor. From the south, drive through the village of Letterbarrow and continue for a mile or two till you come to the local soccer pitch. Turn left (signposted Disert Graveyard) and then right where there’s room to park on a grassy verge (G882869 A). At the top of the track pass an abandoned farmhouse and continue over a ditch into open hillside. As we climbed the dry slopes we became aware of many people of all ages doing likewise, apparently an annual walk for the locals and part of The Frosses Summer Festival. A sheep fence provided a handrail ascending into a cleft between the cliff-bound summit and a minor knoll. Once at the top it was a brief ascent to the crowded summit where, bizarrely, were were met by dozens of Elvis impersonators and a man playing a fiddle. Besides the cairn and it’s illuminating cross, there is another steel cross and also a newly installed steel sculpture of a Fimnn McCool character. 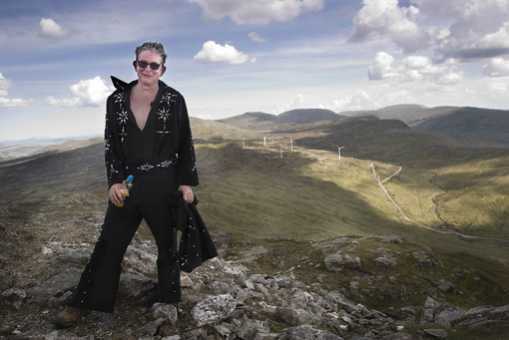 As we munched our sandwiches, we were witness to more Elvis’s in varying authenticity of garb sweatily emerging onto the smallish summit area. It would seem that it was all part of a fund-raising attempt for local cancer-treatment facilities.